Glad to learn that probably for the first time, the Anomaly Committee provided full hearing to the military supported by @manoharparrikar. Government committee regularise the Armed Force disability issue as 6 CPC recommendations. Policy makers should implement it without impediment from present and future CFAs. 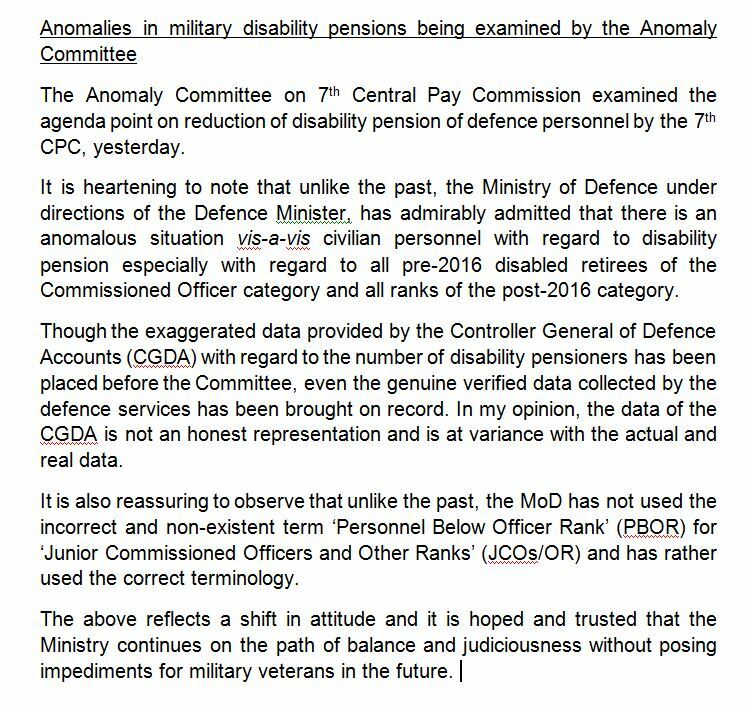 anomaly committee should analyse logically, disability should be common to all there should be no disparity in the ranks. no percentage or slab system for different category, when soldier's leg is amputated it is not made of wood whereas other's is made of gold. Let us hope that the optimism of the blogger pays positive dividends shortly.
" Desw is sitting over almost 10000 files of disabled soldiers where AFTs have given directions to grant them broadbanding benefits but all these files are biting dust under some section officer. i spoke to this Hmar chap yesterday(griviance officer so called) and got a pathetic reply...he says there are more than 10000 files and we cant do any thing about it. This much for the justice for soldiers. i expect nothing from these MOD babus and thiz defence minister. they are not the people one can expect something out of them. we start jumping on small gestures but reality is harsh...very harsh. can somebody highlight this negative and contemptful attitude somewhere. Even supreme court directions are not obeyed. This country is in peril.